My Amazeing Journey: I'm Back! I had a great vacation week at Seaside. Florida with my friend Amber. We talked non stop 8 hours there and back and in between relaxed on the beach, ate seafood, read books and magazines, and watched TV and movies. I did not even pack any makeup, nor did I get on a computer all week! It was a total week of 'detoxing' from life! Now, I'm back and ready to tackle my summer project "to do" lists. I'm starting this week with my first and foremost goals of eating healthier and re-visiting the Y which I haven't gone to in a really long time. Wish me luck!! 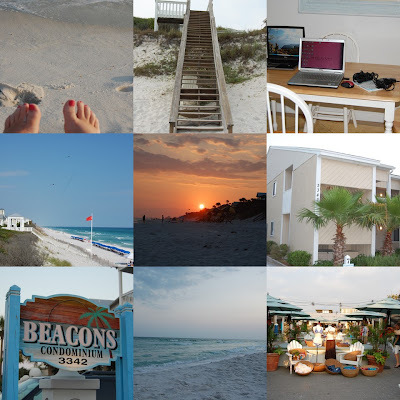 These are pictures from Seaside, Florida. 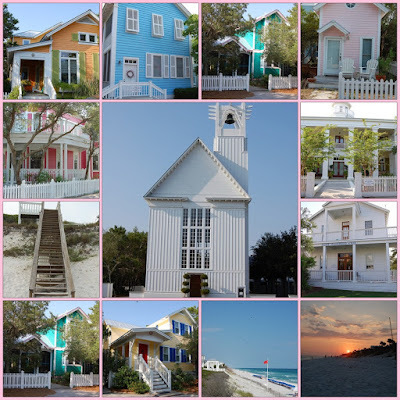 It is the cutest little town right on the beach with the most beautiful cottages. It even has a church and a small school! How adorable! These are great pictures! I love the little cottages. Looks like you had a great and relaxing vacation.